As I type this, the kids and I are on our way to Greece. This will be my second time in Greece and the kids first. Greece is absolutely amazing and I am so excited to show it to them. The entire time I was in Greece two years ago, I couldn’t stop thinking about how much I wanted the kids to see everything too. So, when I say this trip is a dream come true for me, it’s no exaggeration! We are covering many different destinations across Greece, including mainland and the islands. In order to accomplish this we are utilizing every mode of transportation possible, including flying, trains, ferries, taxis, quads, and rental cars. We’ve decided that this trip is a great way to kick off a few new things, the first one being out this daily travel journal. I am going to attempt to journal every day of our trips going forward. I don’t know if y’all will want to follow along with us, but I hope you do. I was inspired by 2TravelDads. They journal their trips and I enjoy reading their last one so much I thought, “What the heck, why don’t I give it a try!”. Every day of our trip I will be coming back to this exact post to update. The second thing we’ve decided to attempt to add is a daily vlog. I’m unsure if we will be able to do this, but we are gonna give it a go. I will be uploading videos to YouTube.com/MommyTravels and on Facebook.com/MommyTravels. Last, but not least, I purchased a drone and been practicing with it. Hopefully this means I can share awesome videos of Greece soon. It’s a haul to get from Portland, Oregon to Athens, Greece. PDX to NYC is 5 hours and 15 minutes. JFK to Athens is a little under nine hours over night. I’ve been packing and preparing for the international flight all last week. I have an entire post dedicated to flying overseas with kids. And so it begins, our 22 day trip! We woke up at 5 AM and headed down to the Portland International airport. We are flying standby, so fingers crossed we make it onto a flight. Have you ever wondered how we are able to travel all the time? It’s partly because we have the ability to fly standby on Delta. We have a family member that works for the airlines, so we are able to go to the airport and wait around to see if there are empty seats on the flight. If there are, off we go. We were suppose to take this flight yesterday, but when looking at how many seats were available I didn’t think we could make it all the way to Greece. Instead of going to JFK and waiting to see I decided to wait a day. Of course, I couldn’t resist and I went to look up the flights and it turns out we would have made it all the way there standby. Of course! 🤦🏽‍♀️ We could’ve been in Athens already, but instead we are still in Oregon. When building this trip itinerary I knew that Delta only offers a few flights to Athens per day from JFK. And they only fly to Athens from JFK, which means we have to get to JFK and we have to make it onto one of the two Athens flights. Coming home, there is one flight a day from Athens to JFK (NYC). So, I have built in 4 days to get there and 4 days to get back. Maybe we will need them, maybe we won’t. The last time I flew standby home from Athens it took three days. At the airport today we got held up in security. Sometimes when we fly standby we do not get our TSA pre-check. I do not know why this is. Sometimes the kids only get it, but this time none of us did. This was my first time taking a drone through security and it didn’t occur to me to take it out of my suitcase. They went all through my bag looking for my make-up wipes and the drone. Lucky for us they were training a new guy. It didn’t occur to him to see if any side of the bag wouldn’t spill. He dropped half my bag everywhere. Fun times. Pack snacks: You might be traveling for long periods and waiting for long periods. Airport food can get old and get expensive in a hurry. Be prepared with enough for each person to have three snacks. Here’s a list of health travel snacks that are quick and easy for families on the go! Be flexible: I highly recommend building in extra travel days coming and going when traveling with more than two people. That way, if you get stuck somewhere you have another day to get there. Always, always keep your medicine with you: often standby passengers are the last to board which increases the chances of them checking your bag. Make sure your medicine stays with you. Your bag will go in through to your final destination, but there are no guarantees that you will. Be willing to take any seat: Know going in, you may or may not get seated with your kids. Get lounge access: Kill time waiting for flights in a lounge. It’s much better than hanging out by the gate. For me the best solution was to get a credit card with lounge benefits. I have an American Express Platinum and that gets us into lounges all over the world, plus it has a bunch of other travel benefits. Get T-Mobile: T-Mobile customers get an hour of free WiFi in most airlines. You also get texting all flight long. So, even if the kids and I are sitting on opposite ends of the plane, I can text them and check on them. Plus, T-Mobile works all over the world. I have yet to visit a country I didn’t have service. Eden and I ended up in Delta comfort +, which means free booze and snacks like bananas, granola cars, and Swedish Fish! Mama’s having a mimosa, maybe even two. Delta doesn’t have champagne like on American Airlines, but they do have Prosecco. Eden and I didn’t get to sit together, but we at least got extra leg room. The boys are in the back of the plane, but they got to sit together. Sadly, none of us ended up in first class. I have a separate post about flying first class Delta also know as Delta business class. On flights going all the way from the west coast to the east coast meals are given to everyone. I didn’t realize we were going to get meals. I have breakfast for all of us packed in my backpack along with a bunch of other snacks. Here’s a look at my breakfast meal, I went with the turkey bagel breakfast sandwich. That’s all for now, but I’ll be back soon to update this travel journal. Here’s some of the days coming up. While in Athens we are staying in an Airbnb. Here is the exact one we stayed at: https://www.airbnb.com/rooms/25397246?euid=df2c2745-f531-2634-c9c8-c8f29e163fda. Hotels were horribly priced for the dates I needed and I realized I could save hundreds of dollars by staying in someone’s house instead. I’m saving at least $250 per night. The other main reason for staying in an AirBnb is typically they will let you stay as soon as you arrive, unlike a hotel that may make you wait until check in. I knew that as soon as we got in we were going to need to sleep. Noah has epilepsy and sleep is extremely important. Him getting sleep is literally priority #1 after an overnight flight. My main goal today after long naps is to take the kids to the Acropolis. We only have a day and a half in Athens, so this is the only thing I have planned. Anything else we may somehow manage to do will be a bonus. We got to the Acropolis at 6:30 PM which gave us plenty of time before they closed at 8 PM. The Acropolis is open from 8 AM – 8 PM every day. Kids under 18 get free admission. My admission was 20 euros, so the four of of cost a total of 20 euros! How great is that. I was unsure when we would get to the Acropolis, so instead of taking a tour, I downloaded Rick Steve’s Acropolis tour. He as many free podcast tours all over Europe, including a few in Greece. For dinner we went to a restaurant with a view of the Acropolis, Savvas. It was really excellent and affordable. Plus, it’s kid friendly. It was around $40 euros for 4 meals, a large bottle of water and a side of hummus. As promised, here is our very 1st vlog covering Athens. Trains in Europe are always an affordable option for families because they give child discounts and youth discounts. In Greece, I was able to get all three kids discounted tickets and myself since we are a family. The train station is called Athens Railway Station. We took an Uber to get here. Before we left the USA I check to see if Greece had Uber. Everything I saw was that they no longer did. I’m happy to report that this isn’t true. You can use Uber to get a taxi and pay all through the app. My plan was to have breakfast at the train station, but it turns out they have no restaurants. Oops! Thankfully, there was a pastry cart with gigantic donuts. The train station in Thessaloniki is much nicer and has a restaurant. The train, like every other train we’ve been on in Europe has a little snack bar with coffee, sandwiches, water, chips, wine, beer, soda, and more. I noticed pets on this train, I guess pets are allowed on trains in Greece. Here’s a disgusting pet story from today. A lady sets up a puppy pad in a chair across from us. We are sitting in the last train car. She then leaves to the front. It becomes apparent that when her dog needs to go to the bathroom, she’s bringing it back here to use the puppy pad. No, I’m not making this up. This is probably one of the most disgusting things I have seen while traveling. Now our train car smells like dog poo. She’s lucky I can’t speak Greek. I certainly tried to stop this from happening and failed. Granted, I am pretty sure the word no is universal as well as making a horrified face. 🤮 The kids didn’t sleep good last night because of the jet lag, so they slept on the train. The route was quite scenic. If you decide to take a train in Europe with kids I have some suggestions. Bring a deck of playing cards, snacks, and water. Book seats facing each other or even better, book a private room with seats facing each other. Keep in mind that having a private room inside the train car can backfire if you do not purchase all the seats. Back in 2014 we had a private room on a train going from Munich to somewhere else in Germany, but I only bought five of the seats. A drunk guy that didn’t smell good bought the 6th seat. His only luggage, a bag full of beer bottles. He proceeds to get up off and on all night long to grab another bottle from his bag in the overhead compartment. The bottles banging around made a lot of noise, especially when he dropped them. He also walked around a little here and there. He fell down once, which was pretty sad. Needless to say we got almost no sleep on our overnight train. Good times! We are so jet lag, it’s brutal. It’s been especially bad for the kids. Here are some tips for dealing with jet lag. Plan to sleep when you arrive – If at all possible, try to arrive at the destination no later than 1 or 2 in the morning. You can immediately go to sleep and begin adjusting your internal clock. Take the sleeping mask and ear plugs the airline gives you. These will help you sleep in the room. Do not sleep all day – If it is daytime there, get outside. The sunshine will help you stay awake. Melatonin – Taking melatonin will help you get to sleep. Melatonin is safe for children. If your children struggle to take a pill, give them melatonin gummies instead. No caffeine – Do not drink any coffee or soda on the plane. It can take up to 14 hours for the caffeine to leave your body. • Good Mattress – Often times the hotel’s website will tout what kind of mattress the rooms have. If not, call them and ask. • Low Noise Levels – Check recent reviews of the hotel to see if others are complaining about noise. • Black Out Curtains – If the website does not tell you, just call the hotel and ask or email them. If you are on social media you can tweet them. • 24 Hour Food – Having food available when you need it is essential when battling jet lag with kids. Whether it is room service or a hotel restaurant with 24 hour service, it helps. Shortly after arriving, they treated me to a wine tasting class where we got to try four white wines and two red wines. All the wines we tried were from Greece. I gotta say the Greeks make excellent wine! (Don’t worry, when I say “we” I mean the other guests attending the wine tasting, not the kids!) The wine tasting was led by an expert and overall simply phenomenal. Here are the six wines we tasted. 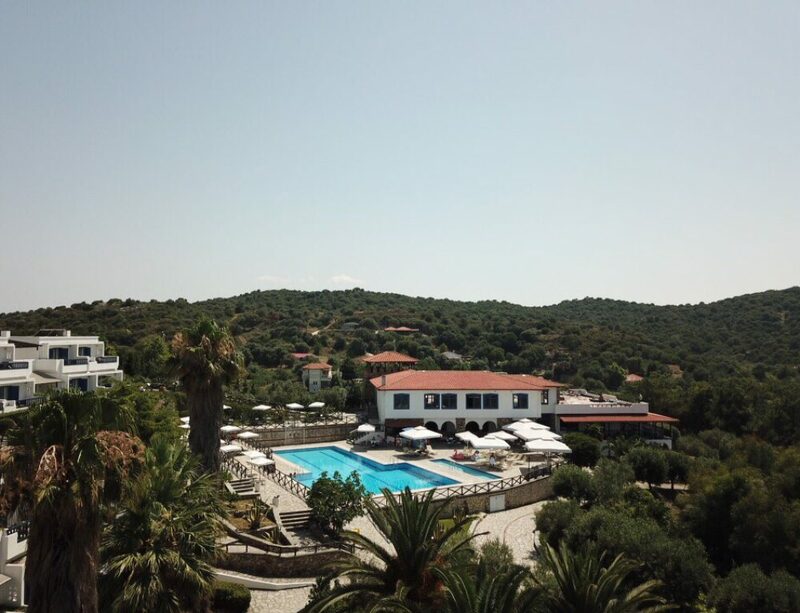 Down in Halkidiki the kids and I are working with some family- friendly boutique hotels. Alexander the Great hotel is the first of four hotels the kids and I will be experiencing in this part of Greece. Here at Alexander the Great we have two connecting rooms that look like this. Today the kids and I are exploring the area around Kassandra. I am driving us around, since you do not need an international driver’s license to drive around Greece. Lucky for us I know how to drive a stick shift, because that’s all they had. Our first stop is lunch in Pefkochori at Smile Gyros. They have super cheap food and you can sit along the beach. There is also an outlet store nearby where I scored two pairs of shorts for $15 euros. Our next stop is the thermal springs. I assume these are some sort of natural hot springs in the forest. Turns out, it’s an indoor/outdoor facility with pools full of thermal water. We would have paid the $30 euros to do this, but one of us forgot to grab their swimsuit. So, onto the next stop, Siviris. This is an old fishing village. Where we had a gelato break. When we got back to the hotel we found out it was Greek night at the hotel’s tavern. Their was a buffet with all Greek foods and Greek dancing. The rain has finally stopped and we indulge in our first beach day. Our hotel is on Alexander the Great beach and it’s a nice long stretch of beach. The hotel has pool floats for sale, which is super handy. They also have two restaurants on the beach. We ordered lunch from one of them, the Oasis Bar. We all got gyros. They also have cocktails, ice cream, and loads of other food options. Here’s our vlog covering day 2 & 3 in Halkidiki. For lunch we are going to Agora Beach Bar. It’s near the hotel at the end of the beach. Here’s a look at Alexander the Great beach. We had a ridiculous amount of fun the day we spent at Agora Beach Bar. During the day we paddle boarded, had a fabulous lunch, sunbathed, swam, enjoyed a live show and more! At night we came back for “The Wedding Party” show. It’s goofy and full of great music. Oh, and it’s kid friendly. Right before the show started Mother Nature treated us to brilliant skies. Day 7: Day Sailing and switching hotels today. Today we went day sailing which took up the majority of our day. From start to finish, we were gone about 7.5 hours. Depending on the age of your kids this could be a little too long, but my kids did fine. It included a bit of snorkeling, but from what I can tell the arm of Kassandra is not the place for snorkeling. Here’s a video recapping our Day Sailing experience. 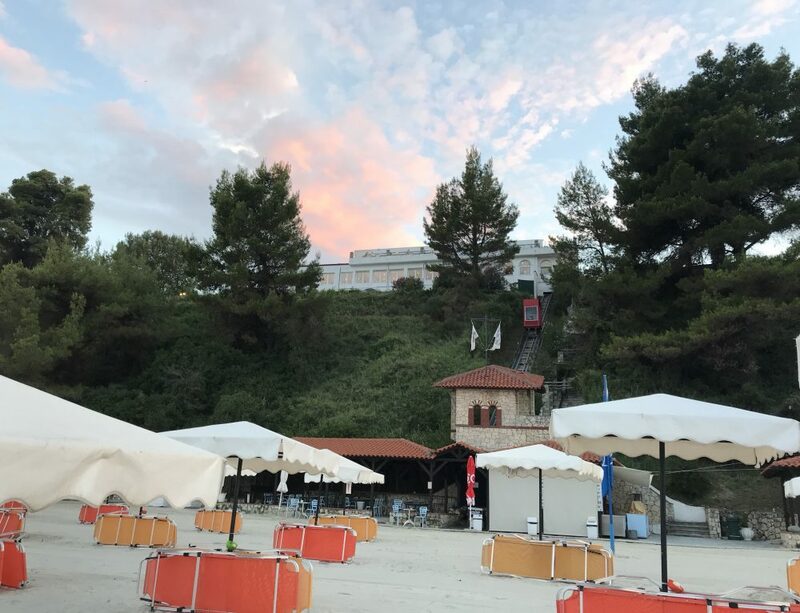 After sailing, we packed up and said goodbye to Alexander the Great Beach Hotel. We drove an hour and a half to Xenia Ouranoupolis over in the third arm of Halkidiki. It’s located right on the edge of Ouranoupolis, which makes it an ideal location. You are close to town, less than a five minute walk and still far enough away that it feels private. Ouranoupolis is a super cute town. I will post some photos of it soon. I just have to figure out which camera they are on. I brought six cameras. Something really cool about where Xenia Ouranoupolis is located is its proximity to the Drenia Islands. They are accessible only by boat, but the hotel can arrange a boat rental for you, because the boat rental is practically next door. They arranged one for us today and it was too much fun. No license needed to rent a boat. The little beaches here and there are beautiful. You can beach your boat along them and have a fairly private beach day. When we stopped at the first island the kids took off climbing and exploring. I stayed back to try and get my drone to fly, which it finally did! I’ll be posting drone footage soon! 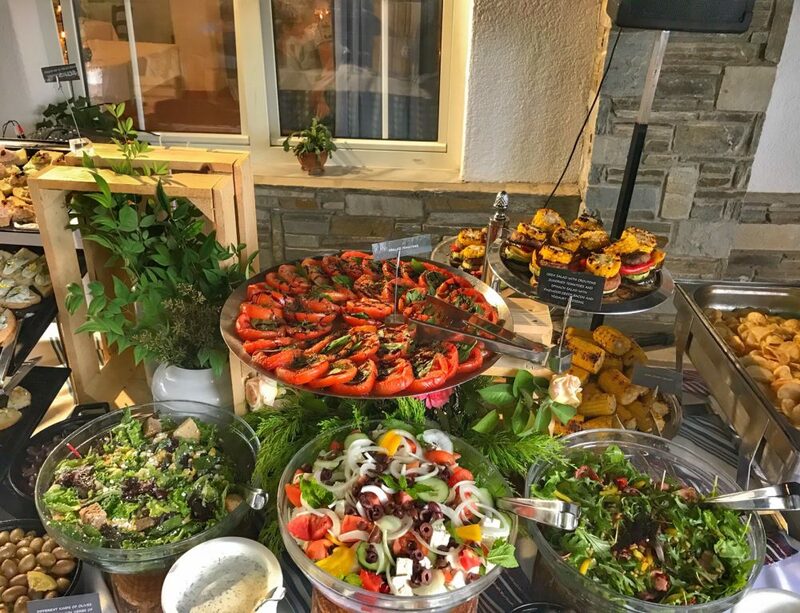 Our hotel, Xenia Ouranoupolis, offers a dinner buffet, but tonight we skipped it and instead had dinner in town at Kritikos. Jonah found the Mt. Athos tour riveting. After the cruise we stopped to have lunch at Zorbas in Ouranoupolis. While on Amouliani Island we are staying at Agionissi Resort. We LOVE this resort! Here is my review of Agionissi Resort. 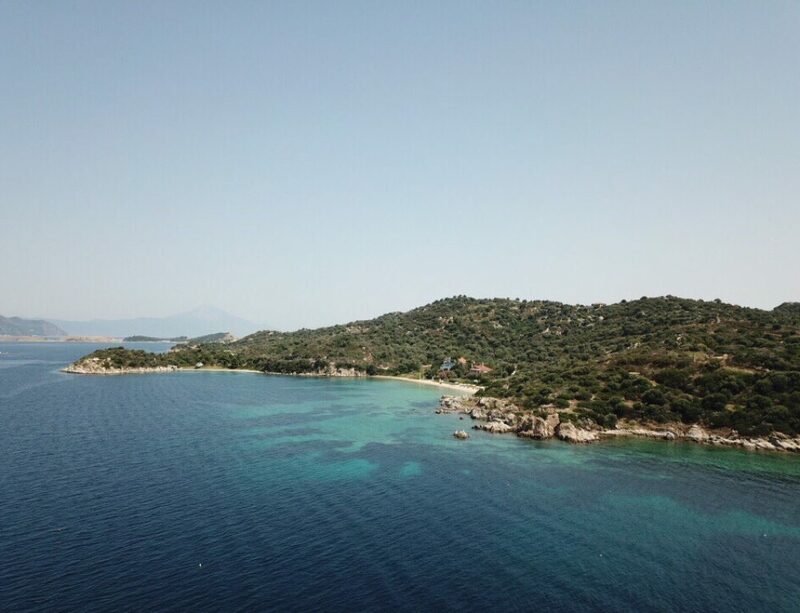 Although the island is close to Ouranoupolis It’s far enough away to feel like a private island far away. One of the best parts of staying here was the nightly sunsets. They were tremendous. The kids are a little sick of Greek breakfast, so they are thrilled out of their minds when we find out they can order pancakes at the pool bar. Day 11: Thessaloniki – It’s my Birthday! While in Thessaloniki we are staying at Astoria hotel. The Astoria Hotel is in a fabulous location and they have large rooms to accommodate families. Also, it’s my birthday! The Astoria Hotel gave me a cake! How sweet is that! Much to my surprise Thessaloniki is a super cool city. Before our visit, we had heard that it wasn’t that nice, but it simply wasn’t true. We walked all over the place and I swear they have ruins or a gorgeous church around every corner. Another thing that was brought up to me by more than one person before we came to Greece was that it wasn’t safe. 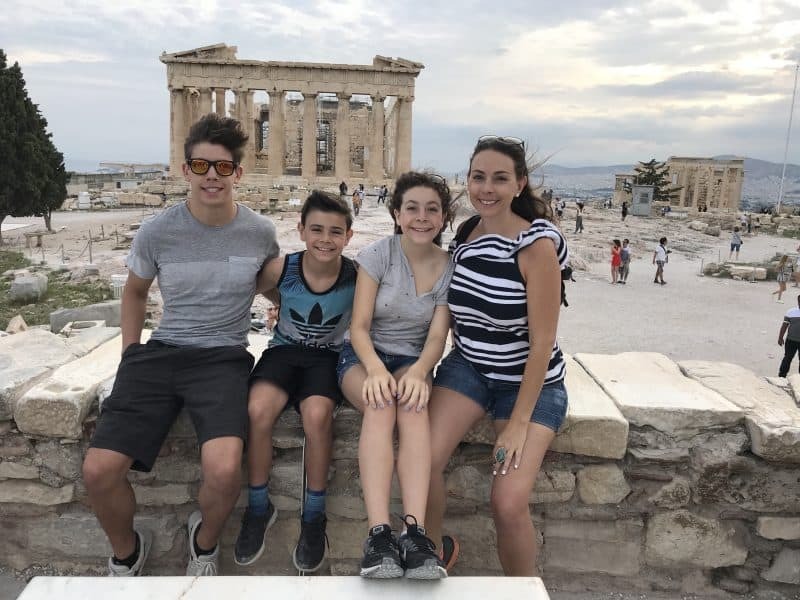 I had a few people ask me why I would take my kids to Greece when things were so unstable. These people were under the impression that Greece had floods of Syrian refugees. (This isn’t true.) Now why they thought this I do not know, but for any of you with similar concerns I want to assure you that this is a non issue. Greece is extremely safe. We couldn’t come all the way to Greece and not visit some of the islands down south. I wanted to take my kids to a bunch of the islands, but the time and money we would spend says that we should only go to a few. I narrowed it down to Crete, Santorini, and Mykonos. I heavily debated going to Naxos and Ios, but I guess we will just have to come back. I’m hoping to score a cabin for our family on Blue Star Ferries as we Island hop. Out of all the ferries I took last time they were my favorite. Right now this is our tentative plan, but it’s not set in stone. Today we went and saw some of Thessaloniki’s old city and then headed to the airport. We are flying on Astra Airlines down to Santorini. After experiencing this airline I recommend not using it. I’m still a little confused by what happened, but here’s the short version. When we got to the airport they made me pay another $88 euros to board. I have never had to pay a fee to board a plane. This was on top of the $400 something I paid for our tickets. And it wasn’t baggage fees. They ran my credit card and handed me a receipt as we were boarding. I plan to talk to my credit card company when we get home. There is no way this is legal. In Santorini we are staying at different places on the island the two nights we will be here in order to see as much as possible quickly and cut out having to go back and forth on the island. The first hotel we stayed at me loved, Ethereum Luxury Cave. The location was super fun just north of Fira. I have a drone video of this area up on my Facebook page. I haven’t had enough internet to post much, but it’s over there if you would like to take a look. 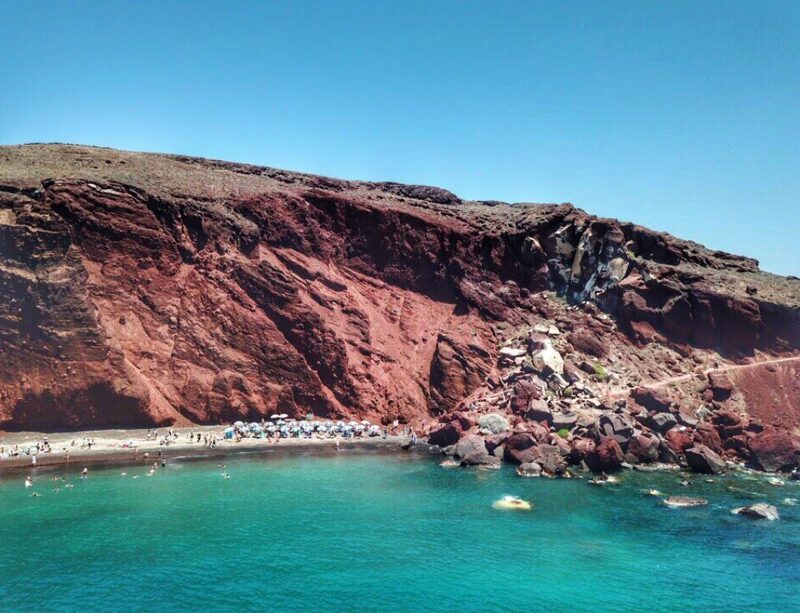 The Red Beach is gorgeous and I think it’s a must see while on the island. As is the city of Oia and we saw both today. We also switched hotels. Tonight we stayed at Armeni Luxury Villas. Sadly, I cannot recommend this hotel. I still made a video of it. It looks great, but only 2 people are allowed in the hot tub at a time. So, we had to take turns. I NEVER would have booked this hotel had I known this. Also, they would not let my kids sit in certain areas of the hot tub and made me supervise the kids at all times. My kids are 17, 14, and 11, they do not need me to sit there and watch them in a shallow hot tub. Unfortunately, the manager was super nasty to me and her office was above our villa, so there was no getting around her rules. I won’t go into her behavior, but the important take away is that this is no place for a family to stay. Jonah was totally enthralled with watching the famous Oia sunset. After the sunset we went and found a restaurant I dined at two years ago, Lotza. It was just as good as I remembered it to be. Today we took the Sea Jet super jet ferry from Santorini to Mykonos. I wasn’t sure how the kids would do on a ferry and I forgot to bring motion sickness medicine, so I was relieved when all of them seemed unbothered by the constant motion. We didn’t do much in Mykonos. It took a long time to get a car rental squared away. By the time we made it to Mykonos City it was sunset time. We decided that our last full day in Greece should be at the beach. We headed over to Plati Gialos beach. After several failed attempts, to drive directly here we parked at Agia Anna beach and walked over. There was free parking and the walk wasn’t too bad. At Platis Gialos beach there are lots of places to rent chairs and umbrellas. I paid 20 euros for two chairs and one umbrella at Mykonos Dove Beach part of Anios sea front restaurant. The handy thing about their umbrellas is that they have solar panels on them, so you can charge your phone off the umbrella. Each section is also attached to a restaurant so you can order food and drinks. The drinks are spendy, so I walked over to a little supermarket and bought drinks and chips. They have alcoholic drinks for 2.90 euros, which is more than 10 euros cheaper than ordering. The little market also had a great selection of ice cream. I scored some super cheap plane tickets from Mykonos to Paris, $37 each on Easy Jet, and I felt like this was a sign we should go to Paris. I then managed to find a hotel room for less than 300 euros, which last minute is pretty lucky. We are staying at the Hilton La Defence. Today, since I’ve done no pre-planning I only have three goals. Notre Dam Cathedral, Lourve, and eat some French food. Some of my friends that know us and our weird sense of humor have suggested we visit the catacombs. To me anytime you get the same thing suggested to you more than once, that’s what you should do. So, off we went to visit the bones of 6 million people underground. Noah has a job now, which is great, but that means we have to go home so he can work. He “retired” from doing gymnastics after 15 years and his gym immediately hired him to coach. He now coaches level 5 boys! We fly standby, so hopefully we can get home in one day. I am so glad you are doing this. What a wonderful way of keeping up with you and the kids! It sounds wonderful so far. I am so thankful your flights went well. Love you! Good Vlog…I enjoyed watching you traipse around. So glad the kids, especially Noah, is learning as you go. Keep having fun! Gross dog story for sure! She should not be allowed to do that…gross! Love you! Fantastic trip! Greece looks amazing!